Health Conference - Sisters United in Human Service, Inc.
Sisters United in Human Service, Inc. is proud to host the 21st Annual Interfaith Health and Human Service Conference. 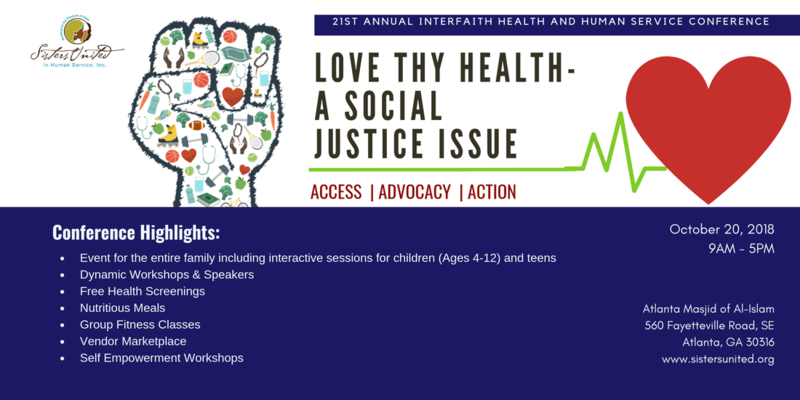 This year's theme, "Love Thy Health: A Social Justice Issue" is an in-depth exploration of current social justice issues and their impact on our health from various perspectives: access, advocacy and action. The ultimate focus and mission of this conference is to inform, inspire, lead the community to action and excellent health. ​Who will facilitate these conversations? Our workshop presenters have been specifically chosen to share from their knowledge and expertise. They are highly regarded professionals representing various fields of study and religious backgrounds. Each presenter is focused on ensuring and helping each attendee understand the value and importance of an authentic assessment of where they are with their overall health, and will share viable solutions and successes toward achieving optimal health. To contribute to participants in ways that support their mental, spiritual and physical well being and foster support of the same with their perspective family members, neighbors and friends. To provide an enjoyable family fun experience to culminate all of the wonderful conference acknowledgements, sharing and learning that offers fun for the whole family (including our littlest ones) as they celebrate together the joy and the importance of living healthy lives.